In 2017, the flagship on climate change mitigation and adaptation research under the CGIAR Research Program on Forests, Trees and Agroforestry (FTA) is all set for the next six years of research work in FTA Phase 2. The importance of forests in climate change mitigation and adaptation has strongly been recognized in the Paris Climate Agreement of 2015. Thus, the Paris Agreement – and the gaps therein – set the stage for climate change research in FTA. The challenge now lies in supporting countries in their quest for national efforts of mitigation and adaptation, e.g. as specified their nationally determined contributions (NDCs). The role for a research-for-development program is to support these national processes with science-based knowledge, tools and advice. 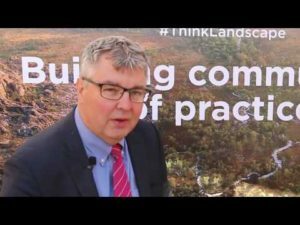 How can we achieve effective land-based mitigation of climate change? How can people and forests effectively adapt to climate change? How can we sustainably produce bioenergy in developing countries? How can we reliably assess the performance of policy and practice addressing these goals? Here we are briefly looking at what 2017 will bring in each of these four themes, and how this will support countries in their work. But we will also continue to support the actors on the international climate arena with knowledge and data, e.g. by engaging in knowledge sharing at the UNFCCC’s Conference of the Parties. In our mitigation work, in 2017, we are re-starting our Global Comparative Study (GCS) on REDD+ (Reducing Emissions from Deforestation and Forest Degradation). GCS has received funding for a third phase, five more years of research towards achieving effective, efficient and equitable REDD+ results. We are taking up new research on the role of non-state actors on linking REDD+ finance streams to REDD+ outcomes and low-emission development strategies. We are re-focusing on eight key countries, which includes starting new work in countries with a promising REDD+ policy environment, such as Ethiopia and Myanmar. At least eight manuscripts will be completed in the area of landscape approaches to REDD+ in 2017. They are related to another REDD+ project under FTA, the REALU project that was concluded in 2016. In addition to REDD+, we will also carry out research on how different market-based instruments such as Payments for Environmental Services can support addressing the drivers of deforestation and degradation. We will explore the link between restoration and climate change (e.g. assessing the size of the carbon sink that can be generated with global restoration efforts), which is central to achieving the ambitious Paris objectives. Without massive restoration, the reduction of global warming can hardly be achieved. Countries such as Ethiopia and Colombia, that address restoration in their INDCs, will benefit from this. New research in Colombia will support our efforts to achieve carbon accumulation in agricultural lands together with emissions reductions from avoided deforestation, e.g. our new initiative with the BioCarbon Fund and the SNAPP project, both focusing on the Orinoquia in Colombia, and both newly aligned with Flagship 5. Regarding particularly carbon-dense tropical wetlands, our Sustainable Wetlands Adaptation and Mitigation Project (SWAMP) will continue its research and capacity development activities in 20 countries with 250 partners, and we are engaging with several international Blue Carbon initiatives. In our adaptation work, we focus on developing risk-assessed ecosystem-based adaptation policy and practice. We are working on the adaptation of people and forests to climate change e.g. by exploring the links of migration and forests in Indonesia, Peru and Tajikistan. This shall increase our understanding of the changing ‘human resource base’ and the role of remittances to shape forest and other areas affected by global change. It will benefit these three but also other countries facing the same “rural exodus” and other demographic changes in the rural areas. We will continue to disentangle the trade-offs and synergies of adaptation and mitigation at the landscape scale, to create a basis for multilevel governance decisions. With better adaptation to climate change, forest-dependent people, smallholder agroforestry farmers, and eventually the world as a whole, will become more resilient against climate shocks. This also includes advice on gender-specific knowledge and local solutions for smallholders to cope with climate-change risks, in order to reduce their vulnerability and for them to benefit from mitigation. In the Sahel, we assess different land rehabilitation initiatives, using a combined mitigation-adaptation framework to analyze benefits and trade-offs particularly related to marginalized groups. Also in the Sahel, we engage in a multi-stakeholder dialogue to highlight the important role of forest and parklands in the mosaic landscape to enhance the resilience of smallholder systems. The Biodiversity and Watersheds Improved for Stronger Economy and Ecosystem Resilience Project (B+WISER) will produce four Comprehensive Land Uses Plans (CLUP) which articulate the current conditions and development targets of the municipalities with regards to gender equality, particularly the role of women. It also identifies needs of local government units in its technical capacity. Other outputs are nine proposals to access funds to implement adaptation programs that target gender equality and capacity development. The goal of our bioenergy research program is to develop integrated approaches to food and bioenergy production. We will conclude our analysis on the status of bioenergy types, including the sustainability of agroforestry, and Life Cycle Assessment and Net Energy Balances of agroforestry-based biofuels. We are initiating an overview of biofuel initiatives globally, and we will develop a first analysis of the role that woodfuels play in Intended Nationally Determined Contributions (INDCs) in sub-Saharan Africa. We are also continuing fieldwork on identifying adequate biofuel crops for marginal lands in Indonesia. Forest reference levels will be determined and refined for a variety of situations and land uses, and will be made available to countries. This includes training and capacity development for assessing mitigation efforts in three countries. One new area of investment is related to a project on oil palm diversification. Key outputs here will be a report on oil palm options as basis for scaling-up and a report on innovative business models. Co-learning platforms will be established, and capacity-building workshops held for farmers and technicians. We will also hold workshops and seminars at micro-regional level. We are refining new tools to develop carbon scenarios on the fly during stakeholder consultations, e.g. the CarboScen tool will be updated and refined. It is being used to develop landscape-based integrative approaches to development and to climate change mitigation. We will conclude pilot research on a proof-of-concept for the independent monitoring of forest resources and how to respond to users’ needs by tailoring products according to these needs. We we hope to take up more research in the realm of transparent monitoring procedures that will support countries in their monitoring efforts for example, by providing clear guidelines of how transparency can be implemented. 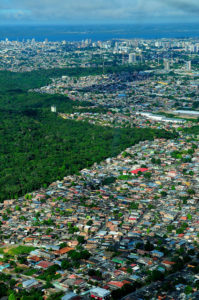 We expect the FTA/Global Forest Watch Terra-I tool to coordinate across all the different FTA projects in Peru that may utilize deforestation monitoring and analysis as part of their larger programs. Terra-I is also conducting a series of capacity development exercises in several countries in Asia in 2017. 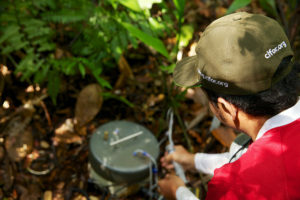 These activities are aimed at training government officials in the use of deforestation monitoring tools and methods. Terra-I will also be linked to the developments in the Big Data platform of the CGIAR and we hope to benefit from comprehensive approaches to big data across the CGIAR. We will commence trainings on Advance Monitoring Systems for Sustainable Community Forest Management with at least five community forests in Cameroon in our Dryad Project. Dryad will train at least 15 Community Forest Monitoring officers in carbon monitoring and other objectives. Under GCS-REDD+, we will continue to assess the policy progress with REDD+ using our data from 13 REDD+ countries and examine whether the promise of performance-based funds has played a role in enabling the establishment of REDD+. We will also conduct impact evaluations for national forestry policy such as payment for environmental services (e.g. in Vietnam) and provide trainings in political economy research methods for partners in Peru, Ethiopia, Myanmar, Vietnam and Guyana.